One dashboard. One view of your business. Make smarter business decisions with your personalised digital business dashboard. 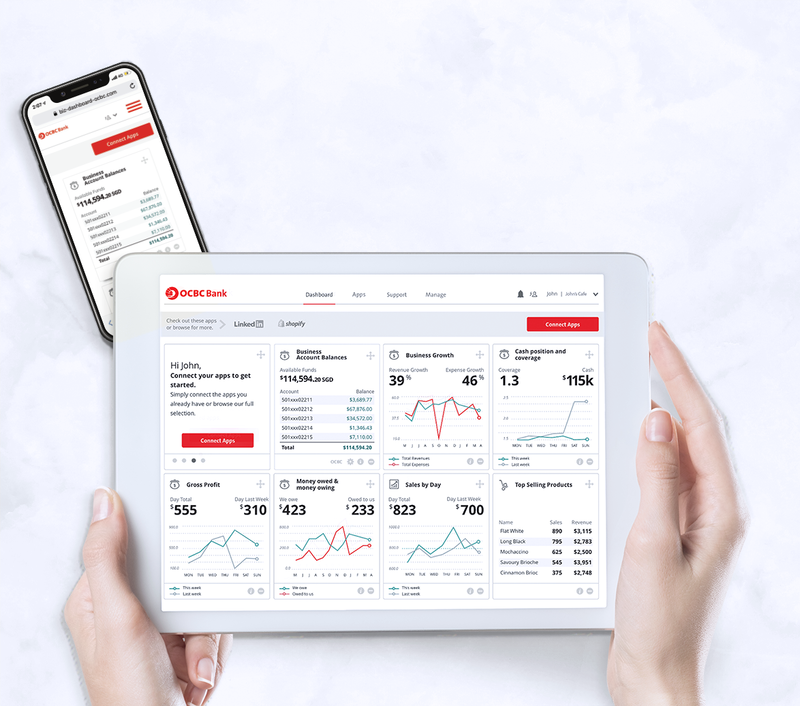 Powered by the data from the various business apps that your business is using, you can now see how the different parts of your business is performing, all in one place, on any device. 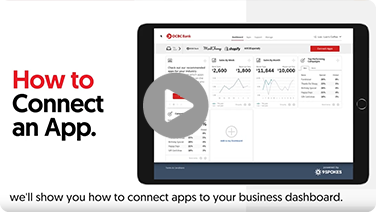 Simply connect your business apps and start seeing patterns and trends that can help you to manage and grow your business better. Free for OCBC Business Banking customers*. See key information you need for your business all in one place. Keep an eye on your cashflow by connecting your business account(s) and your business apps to your dashboard. See your money-in and money-out next to your current available funds. Discover new ways to convert leads, drive sales and acquire new customers. Identify trends around customer demands and forecast future sales revenue with your daily/weekly/monthly sales and top selling product. Optimise your marketing budget as you track the performance of your website traffic, email campaigns and social engagement. See staff schedules, annual leave, and top sales staff in one place, helping you to operate more efficiently. The more apps you connect, the bigger the picture gets. Supported by IMDA and Enterprise Singapore, enjoy 12 months free subscription for any 2 selected digital solutions on the Digital Business Dashboard. 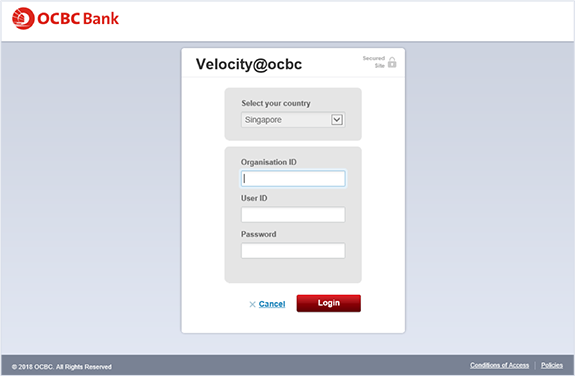 * Digital Business Dashboard is only available to Velocity@ocbc Authorisers under the Standard and Classic package. Business Account Terms and Conditions apply for Digital Business Dashboard. Please view here for more information. The platform you are accessing or about to access (the "Platform") is provided by a separate external third party service provider ("9 Spokes") and OCBC makes no representations or warranties in respect of the Platform. By accessing the Platform, you are acknowledging that the Platform is provided by 9 Spokes on an "as is", "as available" basis. OCBC shall in no event be liable for any damage, loss or expense including without limitation, direct, indirect, special, or consequential damage, or economic loss arising from or in connection with any access, use or the inability to access or use of the Platform, or any reliance on the contents of the Platform. OCBC shall not be liable for any errors or delays in any information or data obtained or found in the Platform (the "Data"), or for any actions taken in reliance thereon. You understand and agree that you will use the Data at your own discretion and risk and that you will be solely responsible for any damages that arise from your use of the Data. All apps offered for sale/download on the Platform are sold/provided by external third party apps providers (the "External Third Party Providers") as indicated on the specific apps listing on the Platform (the "Apps"), and not OCBC. The External Third Party Providers are not related to OCBC in anyway whatsoever and OCBC has no control over any of such External Third Party Providers. OCBC neither endorses nor assumes any responsibility or liability arising in connection with any Apps purchased/downloaded from the Platform. OCBC shall not be responsible for the quality, merchantability or the fitness for any purpose of any Apps purchased/downloaded from the Platform. The Apps and the purchase and download of such Apps shall be governed by and subject to such terms and conditions as may be prescribed by the relevant External Third Party Providers and you are advised to review and understand such terms and conditions prior to you purchasing/downloading any such Apps. The Digital Business Dashboard is compatible with Microsoft Edge, Chrome, Firefox and Safari only.